The ever popular Art Deco period produced some truly beautiful and remarkable pieces of Art Deco jewelry. 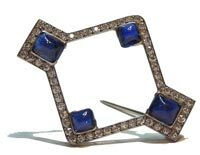 But it’s often very difficult to distinguish a genuine Art Deco jewellery item from a good modern reproduction. One way is to check the findings that are attached to your jewellery. Checking for function, rather than as part of the design. Other things to look for include the cut of precious stones, the weight of the item and for any hallmarks or other period markings.